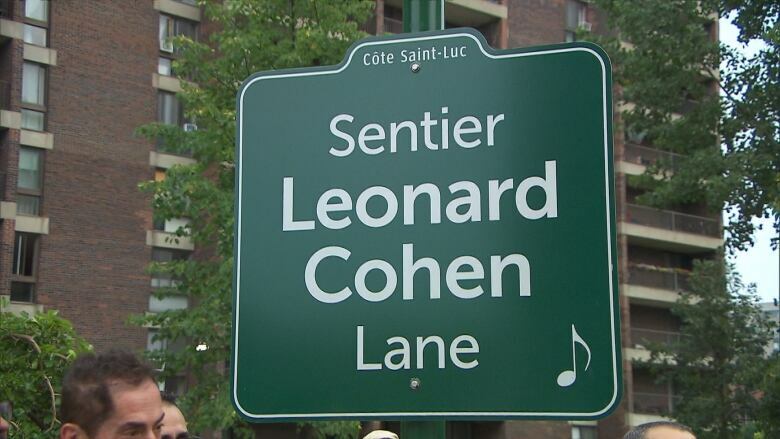 Côte Saint-Luc officially inaugurated Leonard Cohen Lane on Monday in the green space connecting Marc Chagall Avenue with the Bernard Lang Civic Centre's parking lot. It's no Tower of Song or Famous Blue Raincoat, but there is now a small lane in Côte Saint-Luc named after the late Leonard Cohen. 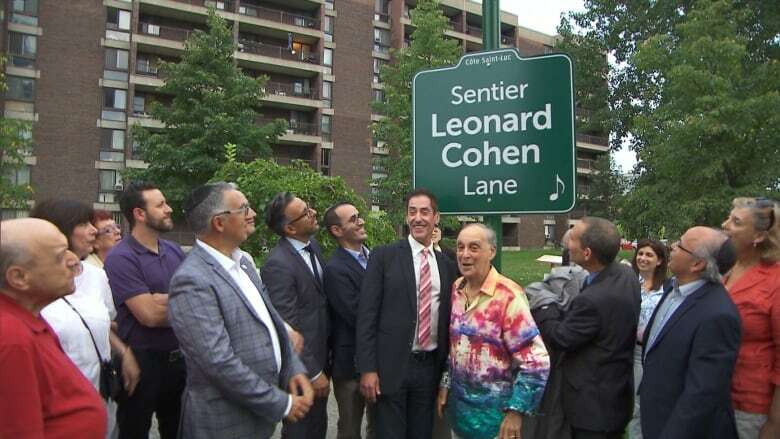 "Leonard Cohen is a testament to what we believe in Côte Saint-Luc, which is providing arts and culture to our community," said Mayor Mitchell Brownstein just before unveiling a new sign Monday that memorializes the Montreal-born singer-songwriter. Leonard Cohen Lane is a pedestrian walkway through a green space that connects Marc Chagall Ave. to Côte Saint-Luc's library and city hall buildings. From Beethoven to Sir Walter Scott, the city has a long list of streets and parks named in honour of artists, musicians, scientists and thinkers. Many, like Cohen, never lived in Côte Saint-Luc. A few dozen people attended the inauguration ceremony, including a childhood friend of Cohen. Raphael Fleming said he first met Cohen when the musician attended Roslyn Elementary School in Westmount. Fleming said he lived in the white house across the street from the school and "Leonard visited us at the house many times. We walked to school together." Years later, they celebrated Bar Mitzvah together in 1947. "We are honouring Leonard Cohen in Côte Saint-Luc because of the influence he had through his words and music," Brownstien stated in a city-issued press release. MNA David Birnbaum, who represents D'Arcy-McGee, said Cohen had "deep and meaningful roots" within the Jewish community. "He was a citizen of Montreal and he never forgot that — citizen of Quebec and Canada and he belonged to the world," said Birnbaum. "His messages were so universal."